Crimea and Sevastopol officially joined Russia as President Putin signed a final decree 21 March 2014. Crimea’s rejoining Russia was triggered by an uprising in Kiev, which ousted Ukrainian President Viktor Yanokovich from power. The new authorities took some steps, including parliament passing a law revoking the regional status of the Russian language, which caused the predominantly Russian region to defy Kiev. Russian President Vladimir Putin said 09 March 2015 he ordered security officials in February 2014 to start planning for Russia's annexation of Crimea. Putin initially denied that Russian troops were involved in the seizure of Crimea, saying the secession was led by what he called local self-defense forces. The Russian intervention in Crimea culminated in a referendum, in which an overwhelming majority of over 96 percent voted in favor of asking for reunification with Russia. Moscow agreed, citing the will of the people and the historic justice of the move as its motives. Kiev and Western countries deemed Crimea’s secession and Russia’s acceptance of the peninsula illegal, a notion that Moscow denied. The US and the EU issued sanctions against some Russian officials and businessmen in a bid to put pressure on Russia over its stance on the Ukrainian crisis. Russian authorities mostly mocked the sanctions. Russian Crimea was led by Sergei Aksyonov, a Russian separatist whose political party won 4 percent of the vote at the parliamentary election in 2010. On 26 February 2014, the region's parliament met to debate holding a referendum on loosening ties with Kiev. Thousands of pro-Russian demonstrators clashed outside the building with protesters supporting unity with Kiev. There was no vote on a referendum, as there were not enough lawmakers to reach a quorum. Anatoly Mogilyov, Crimea's regional prime minister, appointed by Yanukovich. Mogilyov had spoken out against breaking away from Kiev, and the ruling party he represented - Yanukovich's Party of the Regions which controlled 80 seats in the 100 seat legislature - was publicly committed to autonomy within Ukraine. The next morning before dawn, armed men seized the building, and soon it was reported that 53 lawmakers voted to replace Mogilyov with Aksyonov, and 61 voted to hold a referendum on “sovereignty”. The Crimean parliament declared the region’s independence from Ukraine on 17 March 2014 and formally applied to become part of Russia after a referendum Sunday showed overwhelming support for Moscow. With all ballots counted, 96.7 percent of voters in the southern Ukrainian region had backed reunification with Russia after 60 years as part of Ukraine. Russian President Vladimir Putin signed a decree to recognize Ukraine's breakaway region of Crimea as an independent state. Russia also recognized Sevastopol, a Crimean port that houses the Russian Black Sea fleet base, a city with a "special autonomous status" within the Republic of Crimea. The parliament of Crimea, a majority ethnic Russian region within Ukraine, declared independence 11 March 2014 ahead of a popular vote on secession and annexation by Russia. The declaration appeared to be the latest attempt to shore up the legal basis of the referendum, which was declared unconstitutional by the country’s central leadership in Kiev. A representative of the regional parliament’s press office said that 78 of 100 deputies voted to declare independence. The text of the declaration claimed that the action was in accordance with international law, specifically citing a 2010 ruling by the International Court of Justice that affirmed Kosovo had the right to declare independence from Serbia. Russia could absorb Crimea, currently part of Ukraine, in a matter of weeks after the referendum on secession, the head of the region’s parliament told RIA Novosti 13 March 2013. After the referendum, Russia’s lower and upper houses of parliament will hold a formal vote on whether to approve annexation, before Russian President Vladimir Putin gives his final backing. “We believe here in Crimea that these three actions will take a maximum of two weeks, and by the end of this period we should have a constitution. We will send it for approval to the Russian Parliament,” said Volodymyr Konstantinov, the speaker of Crimea's parliament. Chairman of the republic’s Supreme Council (parliament) Vladimir Konstantinov said "We will bring up the issue of expanding Crimea's autonomous status to that of a state. Thereunder, we are planning to build our relations with the central government on a treaty basis.... This land belongs to the Russian world. We would like everyone to remember that. It's a millennium-old history. The people of Russia and Ukraine belong to the Russian world". Authorities of the Autonomous Republic of Crimea planned using the experience gained by Scotland and Catalonia as they prepare a referendum on the political future of their region. Officials in Crimea are confident this will mean that the campaign, the goal of which is to revise the status of the region upwards to a full-fledged state from an autonomous entity, will be conducted in line with all the norms accepted in the current European regional policies. The Crimean authorities do not consider the possibility of proclaiming independence of the republic according to "the Abkhazian version". They believe that the process of joining the Russian Federation will take about a year, Prime Minister of Crimea, Sergei Aksyonov said 14 March 2014. "I think that the transition period will take about a year, after that we will be fully able to enjoy all the processes, benefits as part of the Russian Federation," Aksyonov said at a briefing in Simferopol. He gave a negative answer to a question about a possibility of "the Abkhazian version". "No, we will not have independence. We currently believe, I personally think that Crimea should join Russia as a subject of the Russian Federation," he said. The Supreme Council of Ukraine’s Autonomous Republic of Crimea dismissed the regional government February 27, 2014, electing a pro-Russian party leader as its new chair. The decision to dismiss Crimea’s Council of Ministers was supported by 55 out of 64 Crimean MPs. The no-confidence motion came as a result of “unsatisfactory” work by the regional government. The MPs also voted in favor of holding a referendum to decide the future of Crimea on 25 May 2014. The referendum would coincide with the early Ukrainian presidential and city mayoral elections. The presidium of the Crimean parliament announced that they were confident "that only by holding an All-Crimean referendum on the issue of improving the status of the Autonomy and expanding its powers Crimeans will be able to determine the future of the Autonomy on their own and without any external pressure.” As a result of “the unconstitutional seizure of power in Ukraine by radical nationalists supported by armed gangs,” Crimea’s peace and order is “under threat,” said Oksana Korniychuk, the press secretary of the head of the parliament. The Autonomous Republic of Crimea is situated in the Crimean peninsula. It is washed by the Black Sea in the west, south and south-east and by the Azov Sea in the north-east. In the north the peninsula borders with the continental Ukraine. The area of Crimea is 27,000 square km. The population is 2,650,000 people. Crimea is inhabited mainly by Russians, Ukrainians, Tartars, as well as Armenians, Greeks, Bulgarians, Germans and others. About 68% of the whole population lives in the cities. There are 24 administrative regions (oblasts), the Autonomous Republic of Crimea [ARC], and two municipalities (Kyiv and Sevastopol). In 1954 the Crimean region was transferred to the structure of Ukraine by the Decree of the Presidium of the Supreme Soviet of the RSFSR. Crimea was ceded by the RSFSR to the Ukrainian SSR in 1954, in recognition of historic links and for economic convenience, to mark the 300th anniversary of Ukraine's union with Russia. Water, gas and electricity come across a narrow corridor connecting Crimea to the rest of Ukraine. There are no access routes from Russia - apart from a ferry across the Strait of Kerch. The Republic of Crimea was granted special status, with considerable autonomy in its internal affairs. The identification of the Russian population in Crimea with Russia had initially not led to confrontation between Russia and Ukraine, despite the sometimes elevated rhetoric. President Kravchuk repeatedly expressed the view that the autonomous Republic of Crimea ought to have considerable latitude in the economic field. Ethnic tensions in Crimea during 1992 prompted a number of pro-Russian political organizations to advocate secession of Crimea and annexation to Russia. In the spring of 1992, President Kravchuk expressed his willingness to leave to Crimea the control of all "territorial property" on the peninsula. He also stated that Crimea ought to have "all the necessary political and legal opportunities to realise its special potential". The 1992 Crimean Constitution established Crimea as an independent state linked to, but not part of Ukraine. Crimean leaders declared the independence of the peninsula under a constitution that proclaimed Crimea to be a republic within Ukraine, provided that Crimean laws would have priority over Ukrainian laws, established Russian as the official language of the territory, and allowed Crimea to conduct its own foreign policy. In July 1992, the Crimean and Ukrainian parliaments determined that Crimea would remain under Ukrainian jurisdiction while retaining significant cultural and economic autonomy. Following a series of compromises with national Ukrainian authorities, the 1992 constitution was repealed, and the Verkhovna Rada (parliament) of Ukraine granted Crimea the status of an autonomous republic within Ukraine and adopted a separate law which defines the jurisdiction of the Crimean authorities. The law allows Crimea to pass its own normative acts provided they do not contradict the laws of Ukraine; adopt a budget and impose local taxes in accordance with the Ukrainian national tax system; implement its own policies in the fields of environmental regulation, social protection, culture, and humanities; and conduct local referendums on questions included in the republic’s jurisdiction. On 20 May 1994, the Verkhovna Rada (Parliament) of the Republic of Crimea adopted the Law `On Renewal of the Constitutional Basis of the Statehood of the Republic of Crimea' which resumed the sections of the Constitution of the Republic of Crimea of May 6, 1992, aimed at changing the legal status of the autonomous Republic of Crimea as an integral part of Ukraine. By this act, the legislative body of the autonomous Republic of Crimea violated the Constitution of the Ukraine, its legislation in force, including the Law of Ukraine `On the Delimination of Powers between the State Power Authorities of Ukraine and the Republic of Crimea' of 29 April 1992. A Constitution of the Autonomous Republic of Crimea was adopted on 01 November 1995. Defense, armed forces and security were some other matters which the Constitution of the ARC adopted on 1 November 1995 recognizes as belonging to the exclusive competence of Ukraine. The ARC entered into relations with official bodies of other states and with international organizations only in matters pertaining to the economy, environmental protection and cultural relations that are subject to its jurisdiction. A new Constitution, adopted by the Crimean Parliament on 21 October 1998 had to be approved by the Ukrainian Parliament. It defined the legal framework for an Autonomous Republic of Crimea within the Ukrainian State. The Autonomous Republic of Crimea exercises normative regulation on the following issues: agriculture and forestry; land reclamation and mining; public works, crafts and trades; charity; city construction and housing management; tourism, hotel business, fairs; museums, libraries, theatres, other cultural establishments, historical and cultural preserves; public transportation, roadways, water supply; hunting and fishing; and sanitary and hospital services. The successful completion in 1999 of the work of the Organization for Security and Cooperation in Europe (OSCE) Mission to Ukraine was an important contribution by the OSCE to the process of stabilization in its Autonomous Republic of Crimea. There were complex issues associated with Crimea's multiethnic population and with the return to Crimea of over 250,000 deported people and their descendants, the overwhelming majority of whom are Crimean Tatars. There were considerable difficulties for Tatars still without Ukrainian citizenship who have already arrived in Crimea. Crimean Tatar leaders continued to call for changes in the electoral law allowing them to achieve greater representation in the Crimean and national parliaments; current law does not allow the creation of political parties on the regional level, so Crimean Tatars had to join national political parties or blocs. Only one Crimean Tatar representative was a member of the national parliament. According to the Crimea information portal, the Tatars, who make up 12 percent of the population of Crimea, occupied seven seats in the 100-member Crimean Parliament. Eight of the 25 senior officials in the Crimean government were Tatars, including one deputy prime minister and the minister for labor and social policy, as were two of the 14 heads of raion (county-level) administrations in Crimea. Crimean Tatars remained underrepresented in city councils and city administrations. For example, none of the deputies to the mayor of Simferopol was a Crimean Tatar. The Crimean Tatar representative body, the Mejlis, was not legally recognized by national authorities. Russian President Vladimir Putin told the Russian government on 19 March 2014 to start preparations for the construction of a bridge linking the southern Russian Krasnodar Territory directly with Crimea. Putin said the bridge over the Kerch Strait, connecting the Black Sea and the Sea of Azov, should be suitable for both road and rail traffic. Transport minister Maxim Sokolov said several projects of the bridge to the Black Sea peninsula that would bypass mainland Ukraine will be ready by the end of 2014. This did not happen. 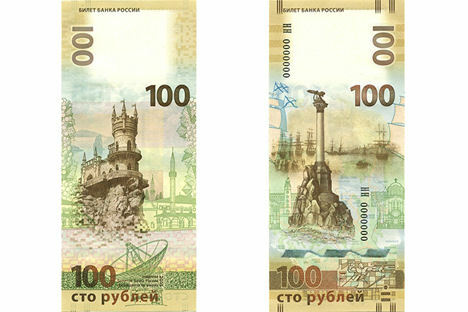 The Bank of Russia issued a new 100 ruble ($1.40) banknote featuring images of Crimea in December 2015. The peninsula's famous fantasy castle, The Swallow's Nest, is depicted on the title side of the note. The other side shows a detail from Ivan Aivazovsky's famous 19th century naval painting "Russian squadron on the raid of Sevastopol". Russian President Vladimir Putin on 15 May 2018 officially unveiled a 19-kilometer-long road bridge linking the annexed Crimean Peninsula with Russian territories across the Kerch Strait. Construction of the bridge, which can carry up to 40,000 cars a day, started in 2016. It was originally expected to open in December but was finished ahead of schedule. A railway bridge is due to be completed by the end of 2019. Ukraine has condemned the project, which cost 228 billion rubles ($3.7 billion). Sanctions imposed by the European Union and the United States have targeted those involved in the bridge, including businessman Arkady Rotenberg, a close Putin ally whose company won the construction contract. The bridge surpasses the Vasco de Gama bridge in Portugal as the longest in Europe.